Note: It must be ensured that the input voltage is more than 1.1 times of the output voltage. For high current operation, please strengthen the heat dissipation. 1 . Open or close the output : Any short state by ON / OFF button to open or close the output, in cycles , the output is closed below with a digital "OFF" display indication . 2. 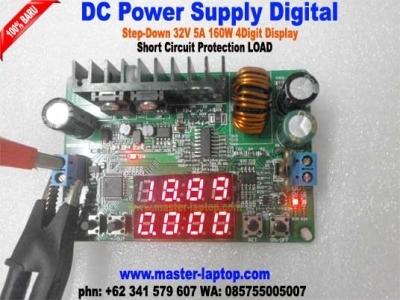 Set the output voltage and current: Short press the SET button , the digital tube starts flashing, press the " +" button or the "-" button to increase or decrease the output value, press the SET button again to switch " 0.01V-> 0.1V -> 1V-> 0.001A-> 0.01A-> 0.1A-> 1A-> exit adjust " during adjustment . 6 S the key without any operation to automatically exit the adjustment . 3. Switch input and output display: In the state of non- output voltage and current setting, short press "IN" button or "OUT" button to switch display input voltage and output voltage . When the input voltage is displayed , the "IN" indicator lights up at the same time , the output voltage is displayed , and the "IN" indicator goes off. 4. CC, CV indication : The module works under constant voltage or constant current status. The CC and CV indicators will light up to indicate CC and CV status. 5 . Current Display zero point calibration: idling state, hold the SET button and hold the power , for displaying the output current zero point calibration, the calibration will automatically exit the calibration process is completed, release the SET key to. 6. Setting data automatic storage: In the key operation process, the digital tube display status , output voltage and current setting data , switch output status will automatically store memory, the default work in the stored state at the next power-on .